The next church highlighted in the collection is that of the First Baptist Church, which was built in 1886 when Rev. E. M. Bliss was the pastor. The congregation itself started out two years earlier with sixteen members, and they held services in a hall on Main Street and in the old Dakota Farmer building until they were able to build their $4,000 church, which happened to be the fourth church to be erected in Aberdeen. Black and white photograph showing a corner view of the First Baptist Church. 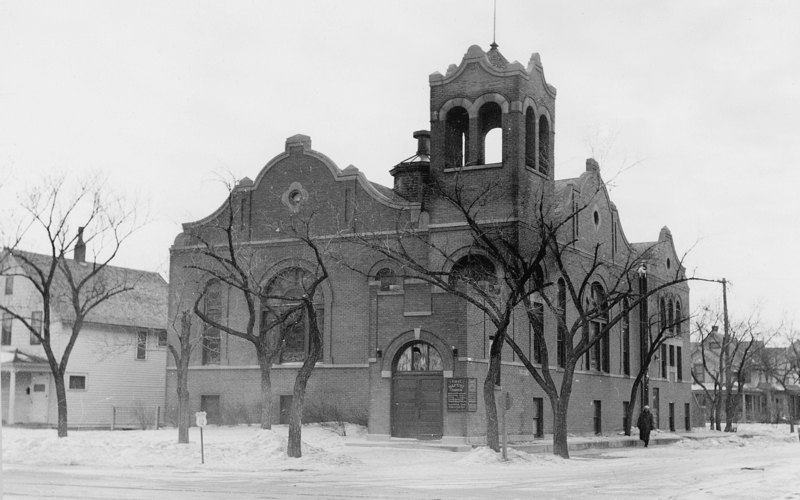 Tragedy struck the congregation in December of 1908 when their church was burned down in a fire started by the heater used to warm the water for the baptismal tank. Not a group to be down very long, however, the church decided to rebuild on an even grander scale in the same location next to the parsonage that survived the fire. In 1909 these plans came to fruition, and Rev. E. J. Parsons was able to hold services in the new church taking after the Spanish mission style of architecture. There the church remained until 1978 when it was demolished from 6th Ave SE, and the congregation moved to their current site on Melgaard Road, boasting of plans for solar heating in their new and improved church building.